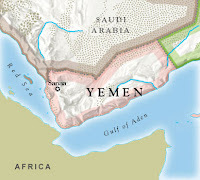 The U.S. and U.K. are now preparing more antiterrorism activity in the country of Yemen. That is supposedly where the underwear bomber got his training. Does anybody else get the feeling we are just following the terrorists from one country to another? First it was Kenya. Then after 9/11 Afghanistan was the center of terrorism activity. We went in there and pushed the bad guys out to Pakistan, where bin Laden supposedly still props up his feet. Now we are chasing them down in Yemen. This reminds me of the old carnival game Wack a Mole. We push them down in one area and they pop out somewhere else. And like that game, victory is elusive. Now read about all the ridiculous new rules the TSA has imposed on travelers flying into the U.S. Are we really safer when we can't use our electronic devices one hour from landing? Or use the bathroom? Or being frisked by some total stranger who probably got his TSA job because his parole officer knew somebody at airport security? When the underwear bomber was able to get on an airplane in Amsterdam without a passport, paid for a one way ticket to the U.S. with cash, and checked in no luggage for an international flight and still wasn't stopped by security, how are these new rules supposed to make us safer? If President Obama could somehow make flying more civilized again, he would see an immediate 10-20 point boost in his popularity, guaranteed.